Today, Israeli soldiers once again denied the Palestinians’ right to assemble and protest against the construction of the illegal separation wall. 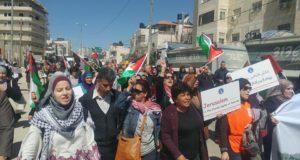 About fifty villagers of Qalandia gathered after the Friday prayer and went to the construction site in a peaceful demonstration. 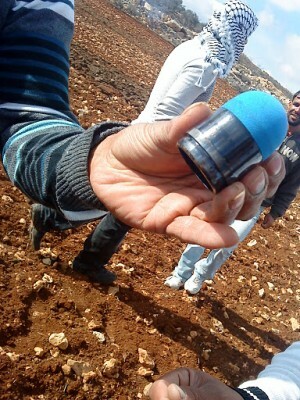 They were not more than halfway before the Israeli occupation forces shot a large number of tear gas canisters towards the demonstrators, most of them minors, and then started to fire rubber bullets straight into the crowd. For two weeks, the villagers of Qalandia, north of Ramallah, have organized their struggle to stop the illegal construction of the wall. The Israeli government issued a map that shows the new tracing of the wall. According to this map the wall would confiscate more of the Palestinian land, 500 dunams in total. 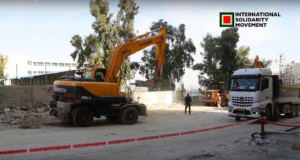 On the 7th of December, in the town of Qalandia, Palestinian and International solidarity activists, after several meetings with members of the Qalandia community, organizers, and Palestinian Authority members, organized their first action in order to stop the construction of the wall. The International Court of Justice stated in 2004 in an important advisory opinion noted that construction of the separation barrier is illegal under the international conventions that Israel itself ratified. 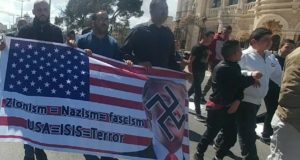 Jenna Bereld and Meriem are volunteers with International Solidarity Movement (names have been changed).